Just have a day to explore Ithaca and Tompkins County? You can discover its rich cultural heritage in this Ithaca Heritage-curated selection of places to visit. Start off a weekend morning at this Ithaca gathering spot during high season between April and October. At this waterfront site where steamboats once plied the waters, listen to music, buy locally made art and crafted items, shop for local produce, and enjoy locavore foods. Attracting thousands of daily visitors, the market is a perfect place to hang out beside the water, people-watch, and absorb the vibrant town-and-gown culture that makes Ithaca unique. Rent a LimeBike and ride along the Cayuga Waterfront Trail that connects the market to Stewart Park and Cass Park, making sure to stop at the interpretive signs that convey area history. Head downtown to DeWitt Park, the original center of the village of Ithaca after it was settled by Euro-Americans beginning in the 1790s. This popular hangout spot is at the heart of the DeWitt Park Historic District, the first of Ithaca’s historic districts to be established. Check out the veterans’ memorials in the park and explore the architecture of the historic churches and the Gothic Revival old county courthouse that line the square. Appreciate the Italianate architecture of the Boardman House, built in 1866 and which once housed the administrative offices for the Ithaca Conservatory of Music (later known as Ithaca College). Admire the Williams House, the Beebe-Halsey House, and other historic homes on a stroll through the district between Court and Buffalo streets and Cayuga and Tioga streets. A strong example of preservation and adaptive reuse, the DeWitt Mall is a Collegiate Gothic-style building designed by noted local architect William H. Miller. Built in 1912, it was originally the campus of Ithaca High School. Converted to retail and residential spaces in the early 1970s, the DeWitt Mall is a go-to local shopping and dining destination and retains the funky vibe that is quintessentially hippie Ithaca. Browse the ground-floor stores for antiques, musical instruments, books, toys, housewares, and handcrafted gifts. Buy a cookbook or dine at Moosewood Restaurant, one of the mall’s original tenants. The groundbreaking vegetarian restaurant has won national foodie accolades, including being named to Bon Appetit magazine’s list of most influential restaurants of the twentieth century. The first pedestrian mall built in New York State, the Ithaca Commons was completed in 1975 and serves as the economic and cultural core of the city. This part of State Street was as early as the 1820s a commercial center and later a transportation hub for trolleys. Today it is a popular regional destination lined by upscale restaurants and shops. It’s a vibrant spot for street musicians and frequent community festivals. Stroll, shop, dine, and appreciate the historic architecture. Starting in spring 2018, take in an exhibit or start a self-guided tour at the new Tompkins Center for History and Culture, where the History Center in Tompkins County, the Visitors’ Center, and the Community Arts Partnership share space with other cultural heritage organizations. A visit to Ithaca wouldn’t be complete without a trip up the hill to Cornell University, established in 1865 as a New York state land grant institution. The Ivy League college’s historic campus contains more than a dozen buildings listed on the National Register of Historic Places. Start your Cornell jaunt at the Martin Y. Tang Welcome Center overlooking Beebe Lake, where visitors can get oriented to the campus and view Cornell-related artifacts. 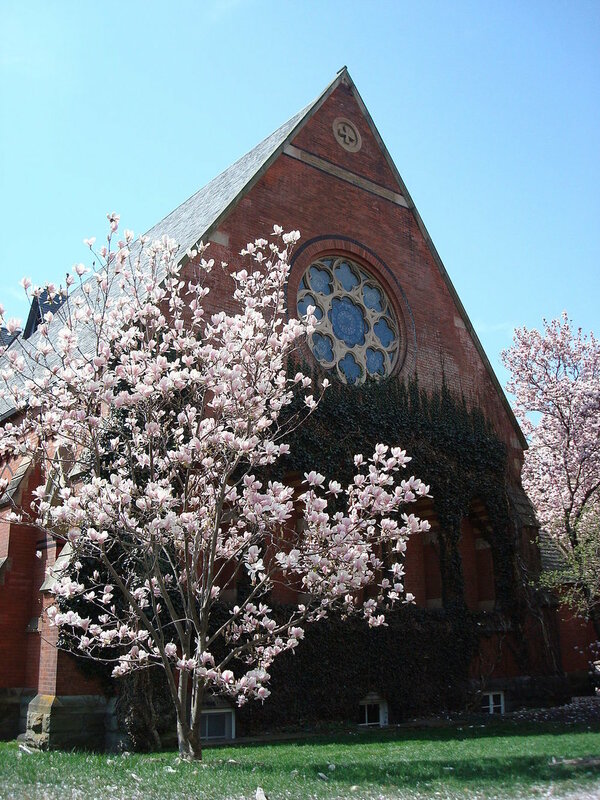 A memorable stop on any Cornell tour is Sage Chapel, built in 1883 and a graceful example of Gothic Revival architecture. Within it significant figures in Cornell’s history are memorialized, including university founder Ezra Cornell, whose remains are entombed in the Memorial Antechapel. Marvel at the sarcophagi in the antechapel while the chimes ring out from the nearby McGraw Tower during one of three daily concerts. The I.M. Pei-designed museum, which opened in 1973, is known as much for its stunning art collection as the spectacular views from its upper floors. Be sure to check out the always well-curated current exhibits as well as the collection of Chinese ceramics and Japanese art during your visit. Click here to download a printable pdf of the One-Day Cultural Heritage Itinerary. Want more cultural heritage destinations to explore in Ithaca and Tompkins County? Check out the Day Two Itinerary by clicking the button below.